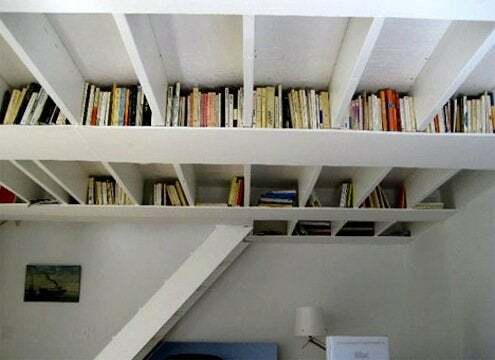 Hunting around your house for space you can use as storage? Don't forget to look up. If you’re just moving into a tiny starter home, making room for growing children, or downsizing into smaller quarters after the kids have moved out, chances are you’re in search of extra storage space. There are lots of places to look for a few more square feet, and don’t forget to look up. Exposed beams and rafters—whether they’re in a garage, attic, or basement—are excellent places to carve out some storage space. If you have access to the first floor’s exposed floor joists from your basement, there are plenty of storage opportunities up there. Rafters and exposed floor joists are especially good for storing long, skinny items like scrap lumber, skis, or drapery rods. For those, you just need to screw in a few hooks to hold the items, or screw in a few cross-pieces. For heavier items, you may need to screw in a more substantial plywood bottom. There are even kits you can buy that let you create pull-down storage bins between the rafters or beams. Be sure to protect your stored items from dust or moisture by keeping them wrapped in plastic or old sheets.